We pulled the whole engine down and put everything away for safe-keeping. After a lot of thinking, I decided to build a 347 stroker with the parts I had out of the other engine, but fit the Trick Flow top end kit as it was on the 302. I know it isn't designed for a 347, but don't know of anyone whose done it and was interested to see what results I'll get out of it. If I could get into the high 12s with this combo, I'd be stoked. A realistic goal I think, considering I pulled 13.1 out of the 302. 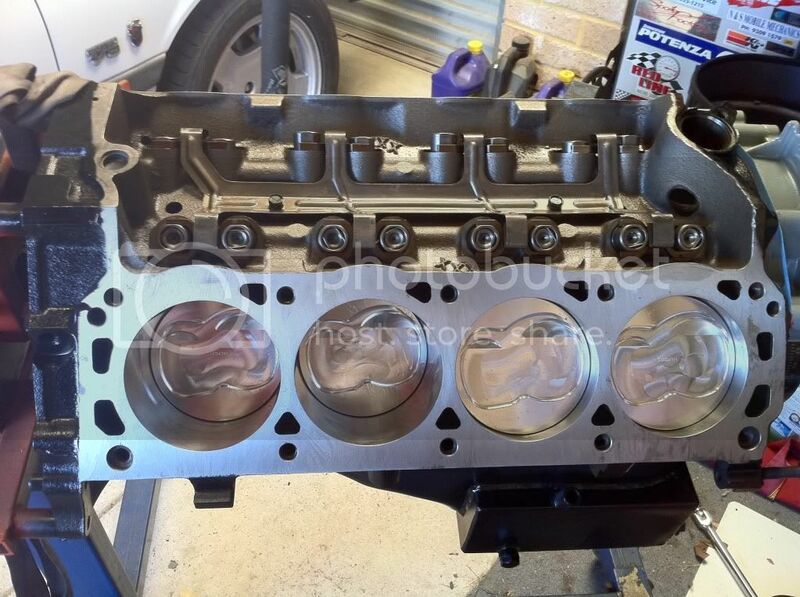 I got an AU 302 block off a mate for bugger all and sent it off to Performance Modifications with the cast crank, I-beams and forged 4.030" Trick Flow pistons I bought from Summit to suit my Twisted Wedge heads, to be machined and balanced. There was also the flywheel and new Powerbond balancer that went for balancing, as well. They also serviced my heads and blasted an Edelbrock RPM II intake that I was fortunate enough to swap for my Trick Flow Street Heat intake. This swap was the beginning of some changes as far as the top end goes. I was really stuck on cam choice. Seeing as though I'm putting a better intake on the motor, I wanted to be able to take advantage of this. I did heaps and heaps of research, and time and time again, I'd keep coming back to the Trick Flow Stage 1 cam being most suited to these heads. This was going off a couple of desktop dyno type programs, which I didn't feel were all that accurate anyway. I had decided to stick with the TFS1 cam when I decided, stuff it, I'll look into a custom cam. So many Mustangs are running Ed Curtis cams in the US and the owners seem to be really happy with his stuff, so I got in contact with him. I gave him the vehicle specs he required (which were A LOT!) and after about a week he had it all worked out. 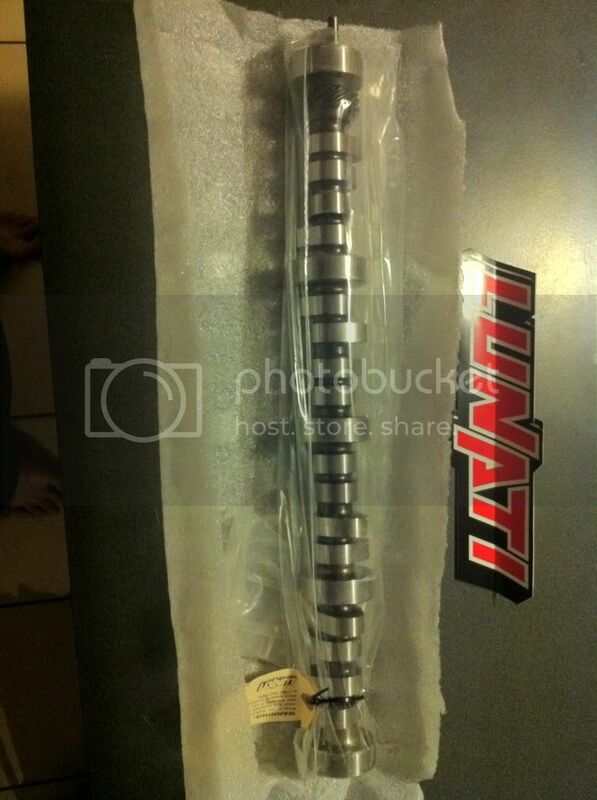 He recommended I upgrade my springs as well to a set of Lunati GM springs. He said my current springs may be ok, but they'd be borderline. This was the first hint I had that there might be a bit more lift in this cam, as the springs I had fitted were good for up to .600" lift. Prior to ordering the cam, the machining was complete and I had Paul at Prestige Automotives in Welshpool put the bottom end together for me. He's very particular in the work he does and has built quite a few impressive motors, although most have been for Holdens. I had him install the TFS1 cam as well, as at that time I thought my decision was made. Last week it arrived. I took it up to Jeff's - out with the old and in with the new. Was hoping to get the timing cover back on, but it turns out the cam bolt for this cam needs to be larger. 7/16" UNC, to be precise. Nothing available locally from ARP, so I just went down to the local fasteners shop and got me a grade 8 one. Will get the old cam washer drilled out, as I can't find a washer thick enough to suit. 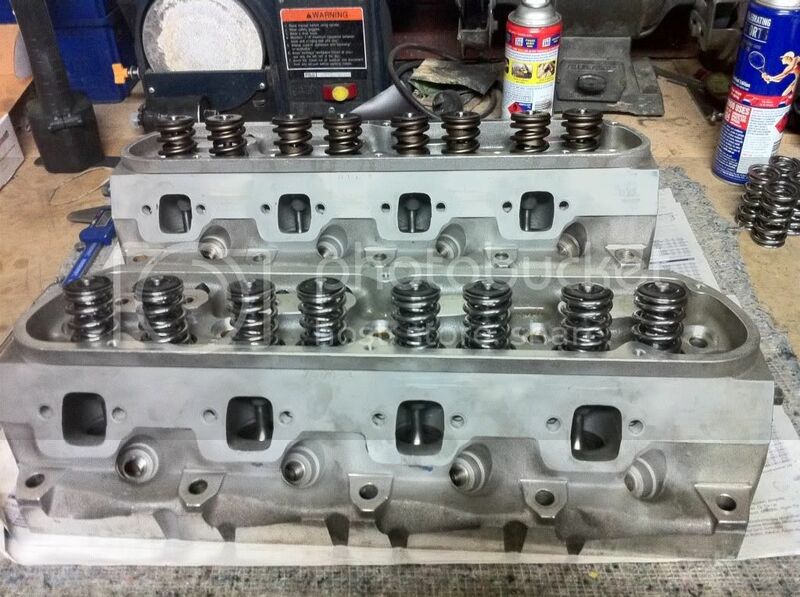 Next thing on the list of things to do was change the valve springs that I bought off Ed, to suit the cam. I was going to drop the heads off to a workshop to get them done, then I thought of a forum member who does pretty much everything himself and has got some great results out of his work. I'm not sure if he's too active in this forum these days, but his username is ozrunner. I went up to JD's on Wednesday night and he got to changing the springs over. Not a difficult job with the correct tools, just time consuming. That's pretty much where she's up to now. Hopefully I'll get up to Jeff's some time soon and be able to spend a solid day on the car and motor. I want to give the engine bay a good clean up while it's empty and depending on how creative I get, I'd love to be able to tidy the wiring up in there as well. Time is the only problem these days as I've been working the weekends and having a day off during the week, which doesn't work out for Jeff, as his only time off is over the weekend. Lift with 1.7 rockers - Intake .600", Exhaust .595"
Awesome build up so far Scaffy. Reading stuff like this just makes me want to buy an 8 even more lol..
KWIKXR - Yeah mate, 8s are where it's at! Haha... Nah, I love them and the note they produce, especially when they've had a bit of work done. I can't wait to see how she performs, either. I'm just taking my time though, making sure I do what I can to get everything right. MICKYYY - That's what I'm hoping, mate! Dont worry it will and i can see u can use that cam still if u upgrade the heads to 185cc as well. What is ur final comp ratio??? This is going to be one strong motor Chad! As you bought Trick Flow pistons to suit your Twisted Wedge heads does that mean when upgrading heads (if you ever do) you will have to stick with TF TW or can AFRs or Edelbrock etc heads be used just out of interest? James, if I were to upgrade heads at any time, I think I would stick with Trick Flow. I'm not too sure of the answer to your question though. Maybe someone else would know. Didn't get Ranch to machine it did you Chad? They f**k my cleveland in a similar manner. Probe....ah well there's the problem. I've forgotten to check and update this. So, my issue with the piston on the p|ss is not really an issue. Just my personal lack of knowledge when it comes to just about anything bottom end. Hey, I'm just a scaffolder! It turns out, with a bit of persuasion, the pistons can be moved around within the bore. Got it sitting flat and it's sitting around .007 proud of the deck, around the same as all of the others. 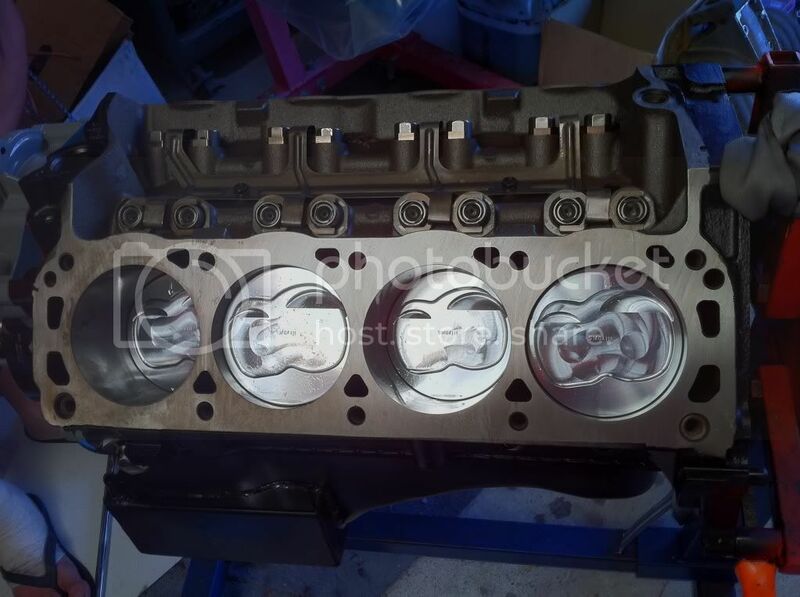 I've got a set of .047" head gaskets to go on, rather than getting the tops of the pistons milled. Money I don't really have to spend right now. So yes, it does seem to be a common problem with Probes. I got them as they were one of the more readily available to suit my Trick Flow heads. In fact, they're re-branded as Trick Flow. Good to see you have progress again, have you got it running yet? Have you had a chance to look at your gearbox yet Chad?............September is only weeks away!!! Haha! Craig, unfortunately progress is going to be at around the same rate until November when I start a new job on equal time, 3 and 3. I'm currently working in Karratha doing 25 days on and 10 off. My family gets most of my time at home and when I do go down to the workshop, it's to work on other people's cars. In saying that, I get home tomorrow night and I hope to have the heads bolted down and start looking in to port-matching the lower intake to the heads. Fingers crossed, eh?! Also, I do look at my gearbox every time I walk in to the shop, but that's going to need a good, solid couple of days to make sure everything goes together as it should. I want that to be a project that starts and doesn't stop until it's finished. It shouldn't take that long, but as we know, things don't always go to plan.